Neurobehavioral Clinic and Counseling Center - Babilon Arts, Inc. Since 1987 the Neurobehavioral Clinic & Counseling Center has been servicing individuals with various types of learning, cognitive, and behavioral issues. Their ability to treat neurologically-impaired individuals and their loved ones has evolved as a result of their extensive clinical experience in major rehabilitation programs. They have identified what does–and doesn’t–help patients as they attempt to regain meaning and productivity in their lives. They treat children, adolescents, and adults. The Neurobehavioral Clinic has been a successful company since it was started in the 80’s. Their logo and branding had stood the test of time but unfortunately their website did not. The look of the website was outdated and the content was hard to update. In addition the dimensions of the website were small, since it was build to be seen in older and smaller computer monitors, and it was not mobile friendly. In order to begin the redesign of the website we conducted design research on what is trending in the industry today. We wanted to incorporate those items to redefine their look but we also wanted a design that would be timeless and be able to hold its own in years to come. We developed several concepts before we, along with the client, felt that we had achieved the desired outcome. This was a lengthy process but in the end well worth the time and effort spent. Next we had to tackle the functionality. We gathered all content from the current site and reorganized it in a way that would flow better. 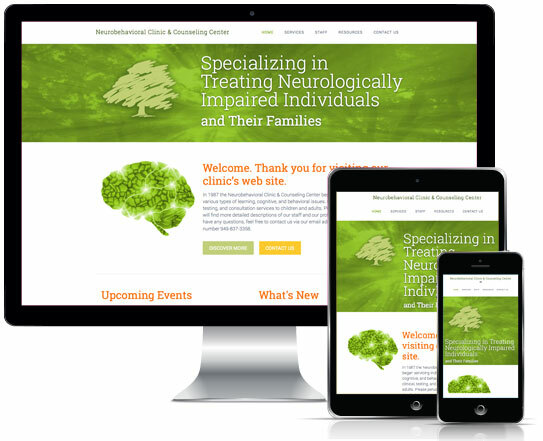 After the site map and design were finalized we then rebuilt the website as a wordpress site. This allows us to add pages easily without having the design each individual page, it gives the client the option of adding content themselves if they so choose, and makes managing the content as a whole a lot simpler. In addition the website now has a mobile friendly functionality and is easily viewed on any smart phone or tablet device.